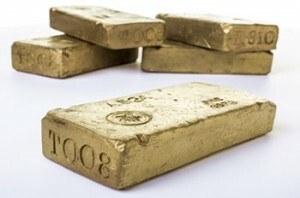 Precious metals futures ended higher in the mid-week trading session Wednesday. Gains in gold and silver were modest, and their first in three sessions. Gold for April delivery added $3.20, or 0.3%, to settle at $1,211.40 an ounce on the Comex division of the New York Mercantile Exchange. "Having been long-standing bears (on gold), we have now turned bullish," ABN Amro said in a note prior to the release of the minutes. "We no longer expect the Fed to raise interest rates again in 2016. We think it will only resume its rate hike cycle once economic growth strengthens and the economy has absorbed the past tightening of financial conditions." Gold futures traded from a low of $1,196.20 to a high of $1,212.70. They declined 2.5% in starting the new trading week on Tuesday with the Presidents Day on Monday. Silver for March delivery climbed 4.3 cents, or 0.3%, to settle at $15.377 an ounce. Silver prices ranged from $15.19 to $15.42. They tumbled in the prior session by 45.6 cents or 2.9%. April platinum rose $12.40, or 1.3%, to $949.70 an ounce, trading between $930.50 and 952.20. Palladium for March delivery settled up $6.30, or 1.2%, to $515.90 an ounce, ranging from $508.30 to $516.50. Gold edged up 50 cents to $1,210 an ounce. Silver shed 10 cents, or 0.7%, to $15.25 an ounce. United States Mint bullion sales were limited on Wednesday to American Silver Eagles, which advanced by 123,500 coins. The U.S. Mint is rationing their sales because of silver planchet shortages and 1 million are allotted for this week. Mint distributors have ordered 92.7% of those, leaving 73,500 until more become available next week.